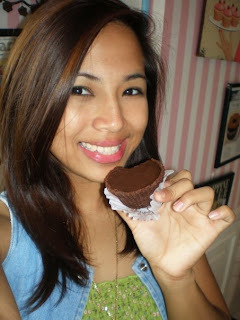 Chocoholic Kriska Joaquin shares her favorite chocolate... of the week. Well this was my one of my birthday treats, and its my favorite chocolate of the week. I am married to chocolate, but to several of them. This one in particular, is a favorite because it suits my everyday mood swings- it is sweet, a little bitter, nutty and caramelized (just like your average girl). If you need to know what's in it (if the name isn't a giveaway enough) - Milk chocolate-hazelnut cream in a chocolate sweet tart crust topped with dark chocolate glaze and caramelized hazelnut.